What really makes me insane is how eager politicians are to use the pop culture â€” not just videogames but TV, movies, even Harry Potter â€” as a whipping boy. It’s easy for them, even sort of fun, because the pop-cult always hollers nice and loud. Also, it allows legislators to ignore the elephants in the living room. Elephant One is the ever-deepening divide between the haves and have-nots in this country, a situation guys like Fiddy and Snoop have been indirectly rapping about for years. Elephant Two is America’s almost pathological love of guns. It was too easy for critics to claim â€” falsely, it turned out â€” that Cho Seung-Hui (the Virginia Tech killer) was a fan of Counter-Strike; I just wish to God that legislators were as eager to point out that this nutball had no problem obtaining a 9mm semiautomatic handgun. Cho used it in a rampage that resulted in the murder of 32 people. If he’d been stuck with nothing but a plastic videogame gun, he wouldn’t even have been able to kill himself. 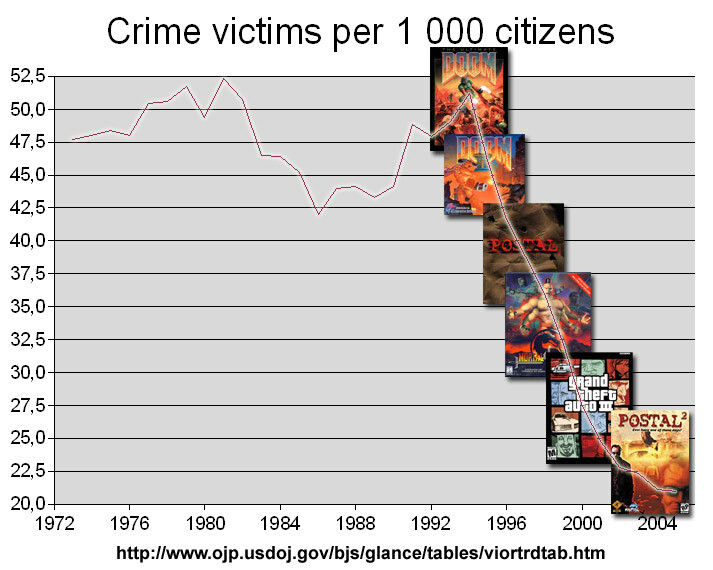 Anywho… here’s a chart showing violent crimes rates along with release dates for major “violent” video games. 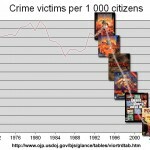 The chart is intended to refute that video games do NOT equal violence. Not that video games are what’s removing violence.